Upon successful healing and control of edema, your physician will most likely prescribe a temporary prosthesis for you. It is very important to inform the practitioner of any goals and aspirations you have. With your goals in mind, the process of prosthetic selection can begin. As a part of your first visit to the prosthetist, your residual limb will be evaluated for any scarring, redness, blisters, or any other problems that might effect the fit and function of a prosthesis. Your prosthetist will then go over the different options for prosthetic interfaces. Depending on your needs, you and your prosthetist will choose which is best for you. The most common types of prosthetic interfaces include pelite, flexible plastic and gel liners. Each has pros and cons that must be considered. Flexible plastic is a common choice in prosthetic design interfaces. There are many types of plastics available. Flexible plastics are moisture proof, will not compress and provide the ability to make numerous alterations to the fit of the prosthesis. They are very durable but do not offer the same amount of cushioning that gel liners do. Probably the most common type of interface is the gel liner. These liners are worn directly against the skin to provide cushioning while still allowing the ability for socket adjustments. It is important to understand that because the liner is worn directly against the skin they must be washed on a daily basis and allowed to dry thoroughly before reapplying. There are many different types of gel liners available and your prosthetist will work with you to choose the best one for you. After the socket design and interface choices are made, the prosthetist will take a series of measurements from your residual limb that will be used in the fabrication process. 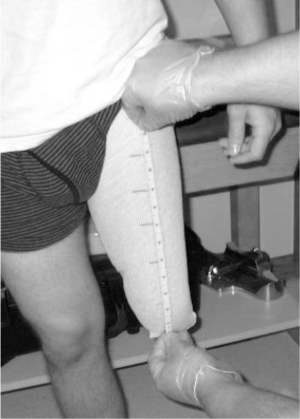 Your prosthetist will then take an impression of the limb using plaster wrap. It is from this impression that your prosthetic socket will be fabricated. This visit with the prosthetist usually takes about one hour. Following the visit, your prosthetist will schedule an appointment for you to be seen back in the office for a check socket fitting in about one week. Our Practitioners are accredited by the American Board For Certification in Orthotics, Prosthetics and Pedorthics (ABC) and by the Board of Certification/Accreditation, International (BOC). We are available to instruct and consult at clinics and are available for facility and home visits as needed.